When traveling away from home, I've a hard time keeping to my training schedule. While blazing down I-35 from Fort Worth to Austin Friday evening with dog, bike, & Deirdre safely contained in the Element, I phoned my friend and fellow traithlete Jeremiah, hoping to arrange a Saturday morning ride. 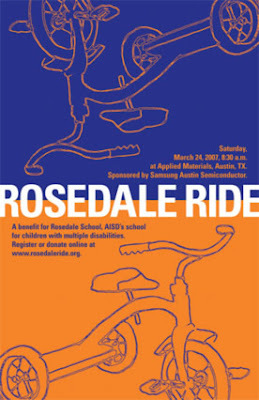 Serendipitously, Jeremiah returned my voice mail to let me know he was doing the Rosedale Ride, an choose-your-distance ride organized by the Rosedale Foundation to benefit the Rosedale School, part of the Austin ISD and a school for children with multiple disabilities. We enjoyed a beautiful morning ride out with several hundred other riders, some also doing 24-mile and 63-mile loops. Volunteers, including many teachers from the school were also out in force, encouraging riders of all ages and riding ability. The start/finish was at Applied Materials' campus in Austin, which has its own running track which loops a pond in the center of the main buildings. So I was even able to complete my scheduled "brick" workout, which calls for finishing one training exercise and transitioning straight to another - on this day I went straight from the bike to a 20-minute run. Catching up with a dear friend, supporting a great cause, enjoying a wonderful central Texas spring morning, and ticking off a scheduled training a week before the big event... I don't think it could have worked out any better! This message is from Danielle. She is one of the newest Tri Honored Heroes. Thank you for taking the time to train and to do something that will matter a great deal to all of us who have been affected by a blood related cancer. The funds that you raise will help the Society to continue to fund research. Over the past few years, many research advances have been made due to the efforts of people like yourselves who have joined Team in Training. The development of Gleevac was due in part to the funding of Dr. Brian Druker received from the Society's TNT program. Gleevac has put my CML in remission and has allowed me to lead a very active life-keeping busy with high school studies, club soccer, and the normal activities of a sixteen-year-old. I hope that I will have the opportunity to meet you over the next couple of months. They are worth a bit of money (up to several dollars per phone) and you can offer them as a donation to LLS. A big box of phones will take me one step closer to my fundraising goal. Send your phones to: Deirdre Goodman, 2800 Covert Ave, Fort Worth, TX 76133. Or if you're in the North Texas area - we'll come pick them up! *Note: you need not send chargers, adapters or any accessories. No manuals, no original packaging, no SIM card. Just the old phone - that's it! TNT Participants can earn up to $300 in volunteer credit to support their campaign. Still having credits available, I woke up early on Sunday (truly no rest for the weary!) to arrive at the Rangers Ballpark at Arlington (just renamed from Ameriquest Field), home of the Texas Rangers, by 6:00 AM to volunteer at the Double Play Du. I'm learning about how this business of stages races operates. It's a pretty cool little economy. Race production companies partner with hosts and event sponsors, many of which have a charitable mission. For example, $10 of every entry fee of the Double Play Du goes to support the Texas Rangers Baseball Foundation. The production companies can keep a lean staff, because they work with TNT and other groups to provide volunteers for when they most need help - race day. I get credit toward my fundraising goal. Athletes get a well-staffed event which means a safer and more enjoyable time for all. A good deal all around. The photographic evidence is in - my timing chip was lost in the pool during the 300m swim. Mystery solved! One ankle should have a Velcro strap containing some sort of RF ID device that tracks my position and time as a I cross from swim to transition to bike to transition to run to finish line. A bunch of zeros appear on my official results. Bummer, eh? I had a great time nonetheless. That's why we do these practice races, I suppose. Learn, and avoid these mistakes on the day of the big race. Update (3/21): while volunteering at the Texas Double Play Du, I spoke to the team at RunFar, the company that does the event time keeping. 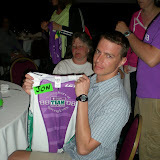 It was the same crew who did the Athens race, and it turns out I was one of two athletes who lost their chip at Athens. He said in pool swims, it's usually closer to four or five lost chips. Come Lone Star, I think I might reinforce that Velcro with some duct tape!! Back in January, while we were all still triathlon neophytes, Coach Tom told us about this great event in Athens, Texas, sponsored by the town's YMCA. It's a Sprint distance triathlon, which is about half of an Olympic distance, and exactly half of Quarter Iron Man distance that our team will divide up to conquer on April 1 - just 15 days from now. Lance Armstrong ran this race when he was a young Texas triathlete. 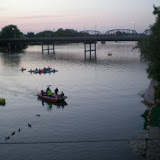 Tom offered this race as a great practice event. So the majority of the Winter North Texas Forth Worth Triathlon team of TNT traveled to Athens on March 10, (about two hours drive from Fort Worth) to compete in this event. A more beautiful day nor more idyllic weather could have greeted us. It was beautiful, even with a patch of fog that forced the local police to delay the race start to ensure the safety of the bicycle portion of the race. I had a fantastic time - an absolute blast. TNT was well represented from our team, Team Starr's Bret and Jennifer and Team Magma, aka Dan M., and other local teams such as Dallas. My only misstep was losing track of my timing chip, which began the race strapped to my ankle, but was separated from me without my noticing. So I have no official results, but I'm pleased with my effort. And our team looked great today; I'm very proud to be a part of this group. Coach Tom had us very well prepared for this race. 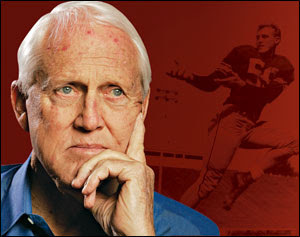 SI.com writer Michael Sliver offers a revealing and touching article on Bill Walsh, his legacy, and his reflections on his life in coaching. As we noted in our November post, Walsh is facing the last fight of his life with grace and dignity. We're still pulling for you Bill. Chris Meehan, reporter for Kalamazoo Gazette, reports on very encouraging news coming from researchers at the Leukemia and Lymphoma Society (the beneficiary of my fund raising effort). "A goal of curing most types of blood cancer by 2015 is realistic and attainable"
"The Leukemia & Lymphoma Society awarded about $60 million in grants to scientists in 2006." Before Gleevec was introduced more than five years ago... about 50 percent of patients diagnosed with chronic myelogenous leukemia every year did not survive for five years. While no one treatment or drug offers a panacea, real progress is being made. Amazing to think we can speak seriously about "cancer" and "cures" in the same breath. I have been meaning for some time now to write a post about Total Immersion Swimming. They have classes in your area with certified instructors. 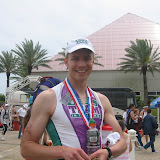 Starting out in triathlon training, I found swimming very frustrating. I just knew I was doing it wrong, and even worse, I knew I was not getting better quick enough, if at all. So I asked around, finally, and bought a book "Total Immersion: The Revolutionary Way To Swim Better, Faster, and Easier." The title does not lie, and this system does not disappoint. Ask me about if you'd like to know more; I can't say enough good things about my experience with TI. If you've never experienced the Dave Ramsey phenomenon via his daily radio-talk show, or best selling books, you can check him out on his Web site. Deirdre and I were given an opportunity to see Dave live recently in Dallas. Dave has a lot of great things to say. You really can't argue with the guy actually. What struck me was his "baby steps" that challenge people to take ideas and put them into practice. It's one thing to know, quite another to do, as we all know who have read self-help books, diet books, exercise books, or even cook books. Dave is all about getting it done. Baby step one: "Put $1,000 away form an emergency fund"
Baby step two: "Pay off all debt using the 'debt' snowball"
Baby step three: "Three to six months of expenses in savings"
While we may see a tension between giving and saving here, Dave's reminding us that it's good to give, right to give, healthy to give, even or especially for those who have the least to give. Give to your community, your church, your favorite non-profit. Giving aligns the giver and her resources with the world around her. Cool stuff from Dave!